1. Navigate over to "Settings" and from the left hand navigation panel select "Team members". 2. Click "Add team member" in the top right. 3. 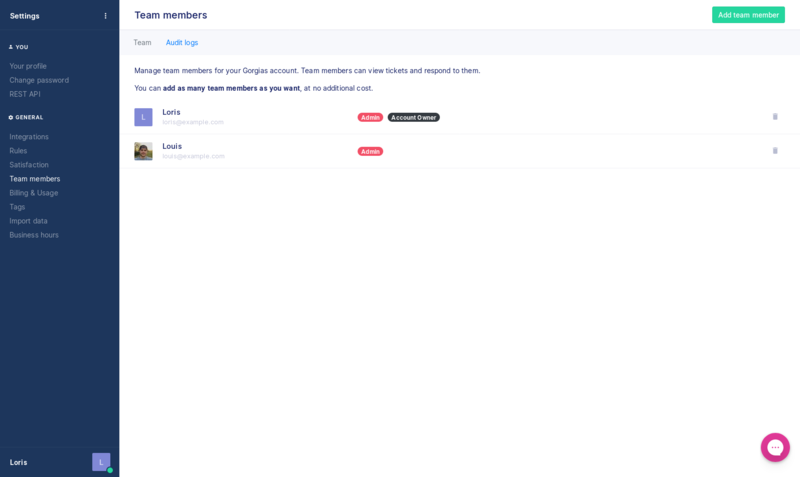 Insert your team members information and select their role. Once you have completed this click "Add team member". Your new team member will now receive an email with a link inviting them to setup their password and login to Gorgias. If you need to edit the user or resend their invitation email go back to step 1 and then click on their name. From here you will be able to make changes and resend the invite. Observer agent: Able to view customers, tickets and send internal notes. Lite agent: Able to modify customers, tickets and send messages. Basic agent: Able to modify customers, tickets, send messages and perform integrations-related actions. Lead agent (previously Agent): Able to manage customers, tickets, tags, send messages and perform integrations-related actions. The account owner is established upon account creation, with the email address used to configure the account. A Gorgias account can only have one account owner. You cannot delete the account owner, nor downgrade their role from admin. 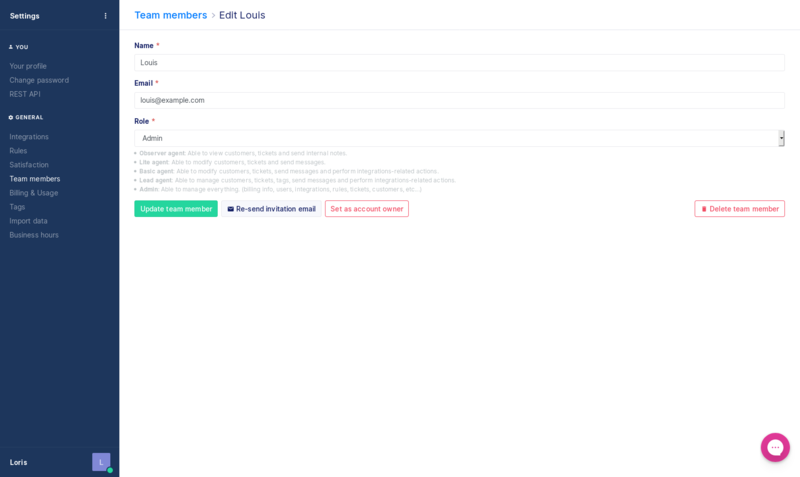 Note that the default billing address of an account is the account owner's email address. Only the current account owner can transfer the ownership of a Gorgias account to another team member. 1. Navigate over to "Settings" and from the left-hand navigation panel select "Team members". 3. Click on the "Set as account owner" button, and confirm. The account owner will automatically become an admin, if not already.